Many a great artist has had a passion for a good stiff drink. Whether writer or painter, sculptor or poet, a great deal of our cultural legacy is inextricably intertwined with alcohol, for better or for worse (and sometimes, it's a bit of both). For Ernie Button, however, alcohol has taken on a whole new level of artistic meaning. 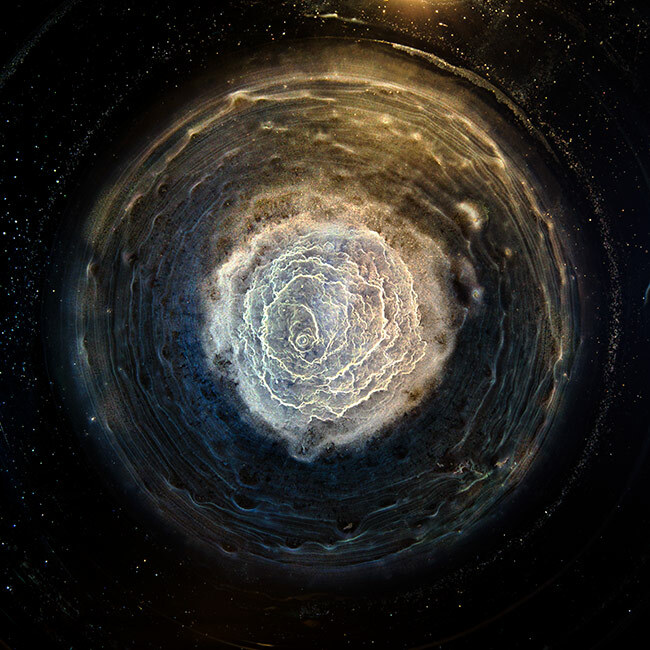 A photographer based in Phoenix, Arizona, Button had a taste for single malt whisky, and one evening before cleaning up his glass, he noticed that the last drop or two of whisky in the glass had dried into a remarkably patterned film. Naturally, his photographic instincts kicked in and he decided to begin to experiment with the concept. Single malt aficionados will no doubt be aware that there are several distinct types of whisky, hailing from various parts of Scotland (there are others from other locations around the world, but to be true to form, single malt scotch comes from Scotland). Islay whiskies, with their dark, smoky peat flavours, tend to be mercurial in the glass, requiring some experimentation to produce a pleasing effect, but Speyside varieties are much more cooperative, regularly creating appealing patterns. The final touch in Button's process is the addition of coloured lights beneath the glass surface which he and the whisky collaborate on (presumably, not always an recently emptied glass, or the project would likely lose direction fairly quickly). The careful lighting helps produce the truly otherworldly images, seeming like landscapes out of a science fiction movie, or perhaps even some elaborate dreamscape. As it turns out, the science behind the process is equally remarkable, as Button found out when he began to investigate the nature of fluid dynamics. Dr. Howard Stone, a professor at Princeton University in the United States, was equally fascinated by the imagery produced by Button, despite not being a fan of whisky in general. In fact, one of his team members, Dr. Hyoungsoo Kim, presented the results of their research at a meeting of the American Physical Society’s Division of Fluid Dynamics, which is much closer to scientific regard than most artists reach. It just goes to show that there often is an appealing intersection between science and art, even if some scientists find the idea abhorrent. You can view the entire collection and order prints from Button's website, located here.